I am a firm believer in the idea that who you are in life is who you are in business. That’s why my coaching is applicable to all areas of your life, whether or not you own your own business. Today’s topic is no different. So many of us, in our daily grinds and hustles along the way, have forgotten what badasses we are and that what we have to offer is a gift! That, to our ideal client, we are offering them the opportunity of a lifetime. Listen in to hear what I mean in today’s episode! I’m breaking down why confidence in yourself and what you’re offering to the world is so needed. Discover what’s in the way of you believing in yourself and why you have to prove yourself wrong! Why my business advice is also life advice – and vice versa. Why you sharing your gifts with the world is so important to others! How being confident in you and your offering affects how you show up every day. An exercise to help you see what’s in the way of you believing that your offer is the opportunity of a lifetime for your clients. Why getting really clear on your messaging and who you’re selling to is so important. How this relates to your personal life. Hello, how are you guys? I wish you could see me right now. My set up. You actually could if you followed me on Instagram. I sometimes post pictures of it, but today it looks extra ridiculous. I’m sitting in my closet on a side table with my mic on top of a shoebox that is on top of a laundry hamper. It looks really legit. I’m kidding, but it’s very funny. I feel like sometimes we envision these things are so glamorous and this is the most unglamorous kind of picture that I could imagine. But I don’t care. I’m committed to getting you guys the content. I’m committed to getting you guys the best quality audio that I possibly can and apparently, this is where it’s at. My office is beautiful and amazing, but apparently the acoustics in there just are not up to par. Anyway, I love today’s topic. It is something that I talked about in my Mango Magic business academy. It’s something that I’ve talked about a little bit on social media, and it’s something that I think is super important and powerful for all of you guys, no matter in your life or business. I mean, this podcast is called Soul CEO. 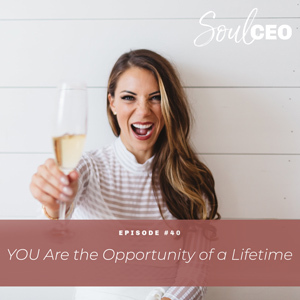 It’s about being the CEO of your life and your business. So everything I teach I typically teach it in a way that you can apply to all areas because I really believe who you are in life is who you are in business. It all relates. It’s all a lesson and we can apply it in different areas. So today what we’re going to talk about is going to sound like it relates to business, but I will connect the dots in how it can also relate to your life, and that is this idea that working with you, like, you providing your product or service with the world as a business owner is the opportunity of a lifetime for your ideal person to be able to work with you. I’m going to repeat that one more time. You giving your gifts to the world and giving people the opportunity to work with you is an opportunity of a lifetime for them. Now, that sounds kind of strange when I say it out loud, I think also there’s a level of gratitude on the other side. Like, I feel so grateful and I feel like it’s an opportunity of a lifetime for me to be able to give my gifts to the world and be able to do this work in the world and work with my amazing clients. But also, at the same time, there’s a really powerful energy when you see that what you are offering is a gift to your ideal person, that what you are providing them is an opportunity for them to show up and create something more in their life or buy something that they really want or create an experience for themselves. And when you can see that, it’s a very, very powerful thing. Like, I really want you guys to think about your business, or whatever your job is that if you thought that what you provided was an opportunity of a lifetime, how you would show up to it. The energy that you would be in. There’s a difference between cockiness and confidence, and I think this is really where it’s at. This is a level of confidence, of saying like, I have nothing to prove. I know what I offer is completely amazing and is going to completely blow the minds of the people who work with me, and I’m sure of that. But usually what happens is we forget this. We forget what a badass we are, we forget that what we are offering is the opportunity of a lifetime for our ideal people, and that takes away our ability to be super powerful in what we are offering. Because I want you guys to think about if you’re like, “My business or what I offer to my clients is kind of cool, it’s going to help them,” that energy is going to come through in the way you show up and the way that you present yourself. If you don’t believe that, you might chase clients down, you might be working to prove your worth to them. But when you know, when you know that your work is impactful, when you are confident in what you have to offer, when you know for your ideal person that their world is going to be completely rocked, you have a level of certainty that is just totally unmatched. But you have to see that. You have to deeply believe that. And so today what I wanted to talk about is getting into the energy of like, believing that for yourself. Now, what I want you guys to think about is what keeps you from believing that what you offer is an opportunity of a lifetime for your ideal people. And I want you to – if you guys have a pen and paper or if you’re in your car you can do this later, but just keep listening – I want you to write down all the things that come to mind that keep you from believing that. Now, the reality is that even if they’re tangible things, these aren’t things that are actually the reason why you’re not feeling this way. It’s just the fact that you think this is why you are feeling this way or why you’re disconnected from the fact that what you’re offering is the opportunity of a lifetime. Then your work is to prove all these things wrong. Because here’s the other thing I want to make sure that you guys are aware of. You’re not offering your product or service to everyone. You’re not trying to work with everyone. You’re trying to work with the specific person who’s the right fit for you, who needs your gifts, who needs your unique gifts the way that you want to provide them. So your right person, you are going to totally rock their world. The wrong person, it might not be true. That might not work for them. But the more clear you are in your message, the more you’re going to attract those right people. So this is kind of a process that I’m teaching you guys, but basically what’s keeping you from believing that what you offer is the opportunity of a lifetime and then I want you to prove all of that wrong. And then I want you to ask yourself, what would I think if I believed what I offer is the opportunity of a lifetime? Like, how is that true for you right now? Then write down or think of the evidence you have to support that. Then from this energy, I want you to ask yourself, what could I add to make my offer an opportunity of a lifetime? What could I add? What would make me go, holy crap, people have got to enroll in this, they would be silly not to, right? Give so much value, give so much impact that you rock your people’s world so much that they walk away just ranting and raving and think you’re the most amazing thing ever and they tell people about it and more people want to invest and change their life the way that they have, right? So I know those are simple questions and it’s actually something we talked about in my Mango Magic business academy group because it’s something that is so, so important and so powerful and when you disconnect from your power, when you disconnect from the impact that you have, then you disconnect from what you are offering and the power of it, and that creates a ripple effect in the way you show up and the actions you take and the way you show up to your clients and the way you show up to the content you put our in their world. The other thing is I told you guys I would explain how this related to your personal life. It’s the same thing in like, dating, for example. When you believe that like – it’s kind of funny way to say it, you are an opportunity of a lifetime to be with, let me change the verbiage a little bit. When you believe you are worthy of like, the most amazing man ever, how do you show up? You have a very strong standard, right? You don’t let some guy like, treat you badly. You’re like, no, no, no, that just doesn’t work for me, that’s now how we operate here. You just have a standard for it, and then you bring in the right people and you date the right people and you really get to figure out who it is that you want to be with because you’ve set this standard. But you have to believe you’re worthy of that. You have to believe that what you bring to the table is rock solid, is amazing, and then you show up that way, right? You won’t feel like you have anything to prove, you just get to be you. You get to be yourself. You get to be the opportunity of a lifetime and then you also get to see that whatever you buy, you want to feel like it’s the opportunity of a lifetime. I kind of crossed over on that example. We’re not buying men here. What I mean is you get to see whatever product or service you buy is an opportunity of a lifetime. You will only buy from that standard. Then you also won’t only date men from that standard too. When you have that, you’re matching love and abundance with love and abundance. Not with fear. Not with lack, not with I need to prove myself, I need to prove something. It’s a totally different energy, a totally different certainty. So I want you guys to practice this week getting into the energy of my product or service is an opportunity of a lifetime for my ideal client and here’s why, and showing up from that energy. And think about what you would no longer allow in your life and in your business if you believed this to be true? Your work to get to that level is to start taking action to let go of those clients who aren’t the right fit for you. Set yourself free, set them free, because when you believe what you are offering is that amazing, you also know when someone’s not the right fit. And you also know just like with dating, when you believe you are worthy of the most amazing guy and you don’t have anything to prove, you also are willing to let go of the guys that aren’t the right fit, or people, or whatever it is. It doesn’t matter. Jobs, like, anything. So I really want you guys to practice getting into that energy and look at how you would behave, the way you would show up if you were in that space, because that is going to change your business and change your life in such a powerful way. So I love you guys, I’m excited to hear your feedback. Put this on your Instagram story. I will try to share it on mine. @lindseymango_, I will talk to you guys soon. Have a beautiful week. Bye.